The Message: “Memories hold all that we know about life and ourselves. Memory is the sacred record keeper of our lives, yet memory and actuality are often different. Actuality is the account of facts, while memory is about how we internalize these facts and how we have experienced our lives, neither being truer than the other. The divine is the essence of life itself – the universal experience that binds us together – and exists both beyond and within ourselves. It is the consciousness of nature and the cycles of nature; life, death, truth, and love. When this universal essence blends with your inner realm of interpretation and experience (your personal reality), you receive inspiration. Symbols come to life, sounds open inner doorways, and words become keys to unlocking the otherwise overwhelming experience of life. 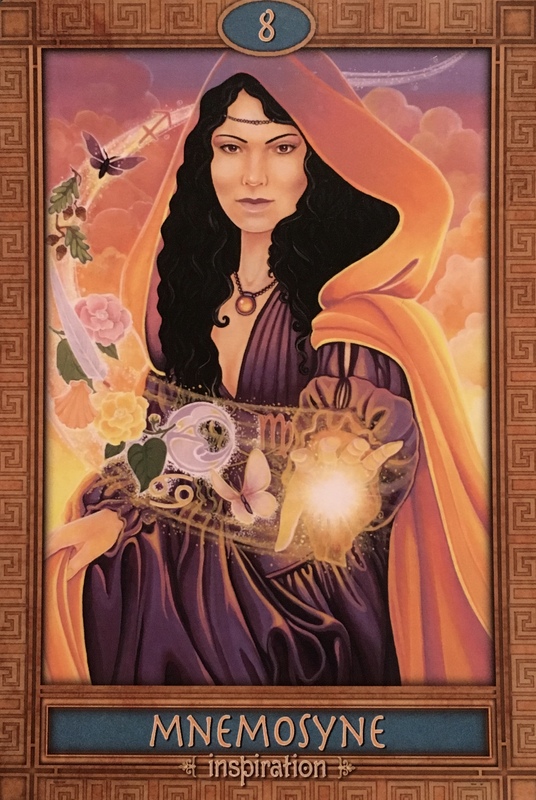 If you have drawn this card, then you are being touched by inspiration now. All that you have gathered from your life, as well as all that you feel from life, is awakening in your mind now. New worlds and opportunities are opening up within you. The full moon called for a shift in perspective, one of those necessary shifts. One that you can come along nicely with, or one that will drag you kicking and screaming through the finish line. Ya, it’s that important. Memories and feelings and experiences all wrapped into neat little packages and stored in our physical bodies will require a gentle unwrapping and bringing out into the Light. It will require a truce between fact and emotional fiction. An acknowledgment, an embrace, a forgiveness and a great release. What else is possible? Inspiration, passion, ignition, co-creation. Past lives blending together into one. Karma released. Body, mind and spirit healed, awakened, ascending. Ready.